The Filipino Australian Movement for Empowerment Inc, a non partisan lobby and advocacy group geared towards the POLITICAL EMPOWERMENT of the growing Filipinos in Australia is set to celebrate the 6th year anniversary in a ‘MUNTING PARANGAL’ to honour all Filipino Australians who have ventured to run for political office in New South Wales. It is to be held on the 12th July 2014 at the Blacktown Arts Centre, 78 Flushcombe Road Blacktown at 5 pm. All honourees and their families, media and dignitaries are invited to this momentous event, compliments of FAME inc and Blacktown City Council . The movement came about in 2007 from the burning passion to see a Filipino- Australian succeed in the political arena. Fame Inc is victorious in recognizing 2 Filipinos won seats in the local councils, Irene Broad and Jess Diaz. Today FAME is as strong and committed as ever in pushing Filipino- Australians beyond their comfort zones to actively participate in mainstream activities....political activities in particular. Mr Rod Dingle, president of the movement will appreciate to hear from our kabanwang Filipinos who took great effort and courage to run for political seat in whichever category, State, Federal or local council elections. 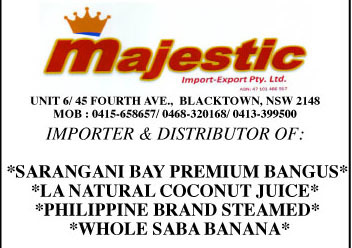 The ‘MUNTING PARANGAL’ event is for you if only to say Thank you for representing our Filipino contingency in Australia.